Laundry is the bane to our existence. Having clean clothes can be a challenge when you have a busy life, are on the go or find yourself like our family, enjoying the great outdoors. Washing machines are not in the highest demand at the gym or the woods if you find yourself camping, however, situations present themselves where you need access to clean clothes and you don’t have access to a washer. 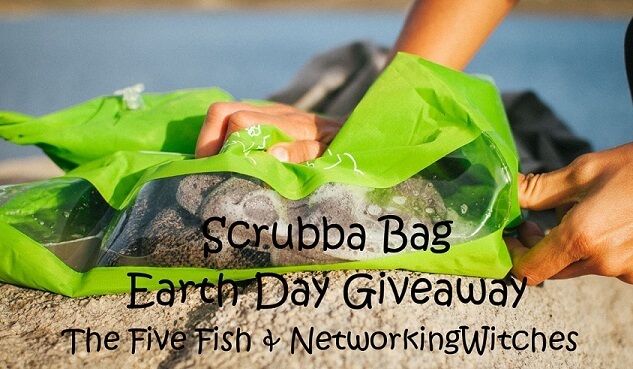 The Scrubba Wash Bag is the most convenient and green solution for clean clothes on the go! Here is how the process works! Just add water and your clothes to the bag with the appropriate amount of detergent. Seal the end properly. Squeeze the air from the pouch and then agitate the clothes on the flexible, internal washboard for as little as 30 seconds or as much as three minutes for a traditional washer style wash. Rinse with clean water and VOILA! You have clean clothes in a jiff. Are you busy and on the go? Do you camp, hike, bike or workout and would love to tackle those outdoor clothes as soon as possible? Maybe you have a baby or toddler and their clothes experienced life’s accidents, spit-ups or spills and they need a wash while you are out an about? How would you use your Scrubba Bag in your life? I shopped their Earth Day sale ad and saw those Eco Nuts Soap Nuts I always wanted to try. They’re on sale too! I can’t find @livingthefantabulesslife on Twitter. Is this spelled correctly? Thanks. I would love to have their Jora JK125 Composter. Would be really nice! Woops, I messed up again on commenting. I commented on thefivefish.com blog here: http://www.thefivefish.com/homemade-wood-furniture-cleaner#comment-129751 on the post: 52 Weeks to Toxin Free Homemade Wood Furniture Cleaner. I put this in the Networking Witches comment entry by mistake (again). Ugh, sorry.